Donald Trump is holding a pre-debate press conference with women who claimed to have been sexually assaulted by Bill Clinton. 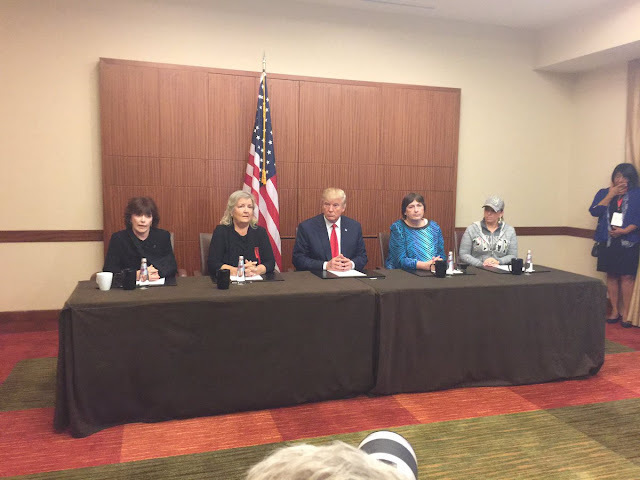 Included at the conference with Trump are Juanita Broaddrick, Paula Jones and Katherine Willey and also Kathy Shelton. With a reassuring tone, El Trumpo told the women " You have nothing to worry, for I shll not grab your p..ies. Not tonight, anyway." They all let go a sigh of relief. But he might grab yours Francisco.